What are Social Justice Bards? Cacophonie has always been surrounded by music, beginning with piano. It was their first love and their first curse. Paraded around various stages, dressed in ridiculous outfits, sealed away from childhood, and forced to learn repertoire they didn’t necessarily like, they eventually found their escape into percussion. At first, it was a wondrous world that brought them orchestra, wind ensemble, chamber music, and marching band. Along the way, they dabbled in the dark arts of music theory, the sorcery of conducting, and the healing powers of music education. But soon, they found academia and the conservatoire were just as exclusive, abusive, and hypocritical as their pianistic upbringing. Although they earned the title Dr. Cacophonie, they set off on a new path of creativity, acceptance, and nerdiness. After many moons of wandering in the twitch-o-verse, Cacophonie was inducted into the Social Justice Bards, a group of nerdy musicians, artists, and gamers who aren’t afraid to fight for what’s right. 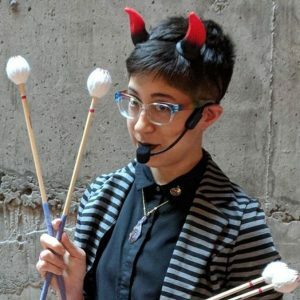 Currently, Cacophonie writes, arranges, and performs their own nerdy music and filk with Soul (marimba), Stardust (Vibraphone), Lilith (Piano), Calamity (Ukulele), and Garnet (Drum Set). They are the drummer for the Power Converters, the band for Hello Earth’s “Wars Outdoors: A New Hope in the Park.” They are also a member of the Seattle Video Game Orchestra and Choir. Cacophonie ironically lives on a Sound in the PNW with Darmund_IntheRough (their lovely tuba-playing spouse), Bayonetta (the feisty tuxedo cat), Muta (the affectionate cat that adopted us), and Marsh (the toasted-marshmallow-colored husky). Catch Cacophonie regularly streaming live music on twitch.tv/cacophonie. Download their music on bandcamp and follow them on all social medias @PercussiveEvent. Cacophonie is a proud artist endorser of Planet Marimba and Artifact Percussion.